Mango Steam Wall-mounted Wine Rack with Stemware Holder and Storage Shelf. Dimensions: 17 inches wide, 10 inches deep, 9 inches high. - Dimensions: 17 inches wide, 10 inches deep, 9 inches high. 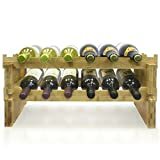 - Wine rack holds 5 bottles of wine. Stemware rack holds 6 wine glasses. - Space saving way to store wine and stemware with integrated storage shelf. - Easy to install. Includes template and all mounting hardware needed. - Designed in America, with all steel construction and a durable powder coating. - Store 24 - 1 liter wine bottles on this rack and up to 24 slim wine glasses. - Crafted from solid wood in black finish. Assembly required. 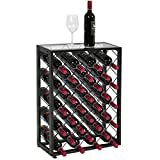 - Overall Wine Rack size is 31.5"W x 16.2"D x 35.6"H. Top surface area of 31.5"W x 16.2"D.
- SPACE SAVING - Compact Size for easy storage, 17.2" L x 6" W x 12.2"H, ideal for wine collectors. - STURDY & STEADY - Sturdy construction made by strong steel wire , thicken color coated for long-term anti-rusty capacity. 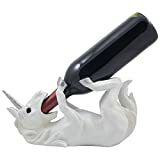 - Wine bottle not included. - Dimensions: 11" x 4 1/2" x 5 5/8" high. Weight: 2.6 lbs. - Individually hand-crafted from cold cast resin with felt pads on the bottom. - Because our polyresin products are individually hand-crafted works of art, colors may vary slightly from what is pictured here.